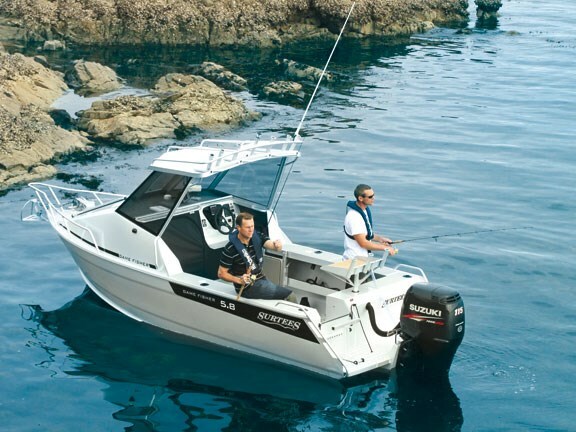 The Surtees 5.8 Gamefisher hardtop, provides a lot of boat for someone wanting to do some serious fishing. Starting with its rock-solid hull, built of 5mm alloy, it has the company's famous flooding keel for stability at rest. This design features a fine-entry hull, variable to 18 degrees at the stern, with no running strakes. 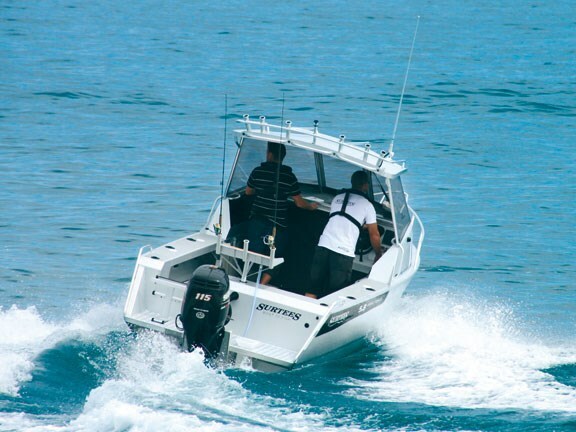 This enables a super-smooth ride and a noticeable lack of pounding through rough seas. With an open cabin, the 5.8 has a day vessel focus, but a zippered curtain will keep the forward section snug for occasional sleepovers. This forward area features two full-length bunks, with an infill. The interior is carpet-lined, and a parcel shelf runs along either side. 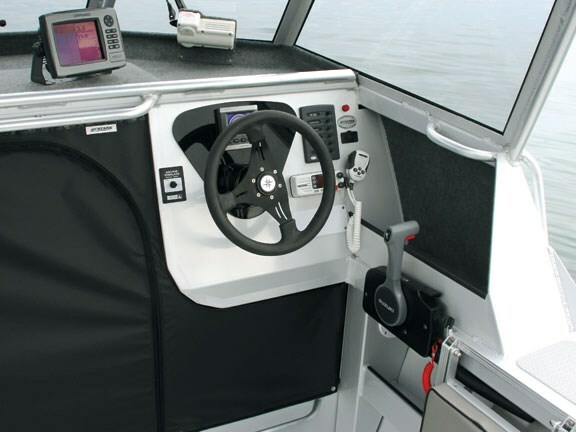 The Surtees signature oversize alloy hatch gives access to the bow area, where a Lewmar auto anchor system is ready to drop the Sarca anchor when required. 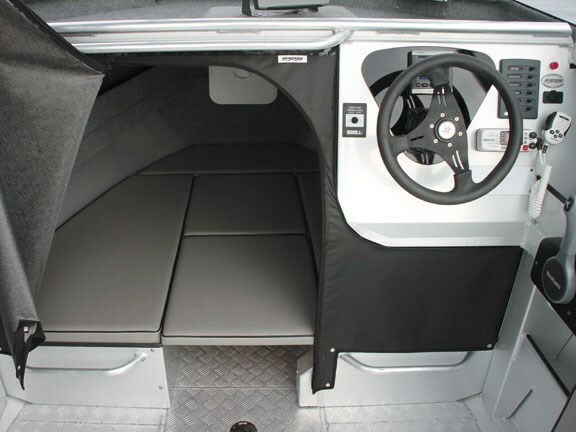 Surtees has elected to fit fold-away padded alloy seats for the skipper and passenger. The cockpit is uncarpeted, although the checkerplate alloy decking gives a good footing even when wet. The cockpit area on the 5.8 is almost the same size as its bigger brother, the 6.7. The 130-litre under-floor tank is filled through a filler in the middle of the cockpit deck, with a fuel gauge close by. Behind the tank is a wet locker area, accessible through a removable alloy cover. The transom features a step-through on the port side, with a live bait tank (with viewing window) set under the step. The remainder of the transom width is covered by a sturdy alloy seat that can drop down to provide seating for a couple of people. When folded up this covers the battery and switches, while a glass fuel filter is tucked up under the starboard gunwale. 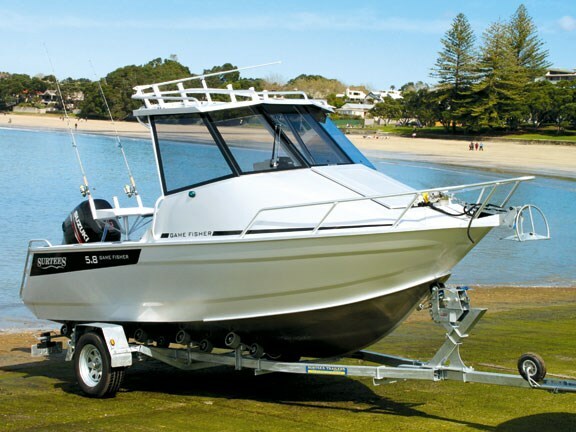 Fishing capability is provided by a sturdy alloy baitboard with three rod holders welded to it, and a number of rod holders set into each gunwale. A nice touch are the drink holders set into the gunwales next to each rod holder. 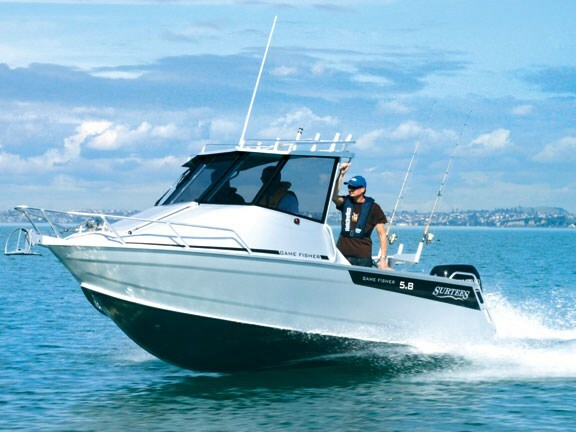 The review boat was fitted with the Suzuki 115hp four-stroke, and this seems perfectly matched to this hull. We powered away from the Takapuna boat ramp, and the hull lifted quickly on the plane. The flooding keel emptied so quickly it was not even felt, and we were able to put the hammer down. In rough conditions where extra stability is required, the water ballast tank can be filled then shut. 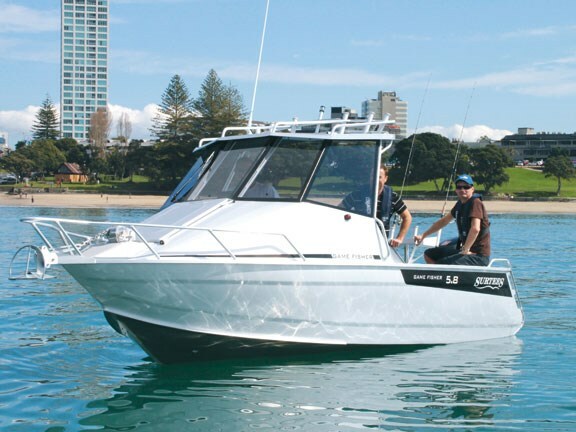 With two adults aboard and a full tank of fuel the boat easily reached 32 knots. Thanks to the Garmin GMI 10 digital gauge, which integrates to the Suzuki's NMEA2000 outputs, we were able to view boat speed, engine RPM, engine temperature, engine hours, charging voltage, fuel remaining, fuel consumption and the engine's trim angle. Dropping the throttle to just under 5000rpm, we were still achieving 27 knots and fuel consumption was showing under 23 litres per hour - around 0.85 litres per nautical mile. This would give a range in excess of 150 nautical miles, depending on conditions and load. We threw it around a bit and jumped a few wakes and there was no crash-and-bang typical of an alloy hull. When turning the wheel hard over the chines come into play, gripping nicely and preventing the hull from skipping sideways. The steering was very light thanks to the hydraulic steering unit fitted. Both the standing and seated driving position are comfortable. The Lowrance HDS7 chartplotter/sounder was useful when getting in really close to the rocks off Tiritiri, with the 640 by 480 pixel screen easily viewable in the bright sunlight. The "Broadband" sonar technology enabled us to clearly see targets on the bottom. The low-speed handling of the boat is excellent. A hinged diving ladder and grab handles make it easy for a swimmer to get back aboard, and this boat would make a useful diving platform. This boat comes on a Surtees galvanised multi-roller trailer. With a hull and engine weight of just 775kg (excluding fuel or any extra gear), this rig does not need a braked trailer and it is easy to tow. Overall a very impressive big little boat, with stability and performance far beyond its class. This is a boat you would be comfortable going far offshore in, and it will be able to handle the worst conditions and bring you back safely. See Surtees boats for sale.